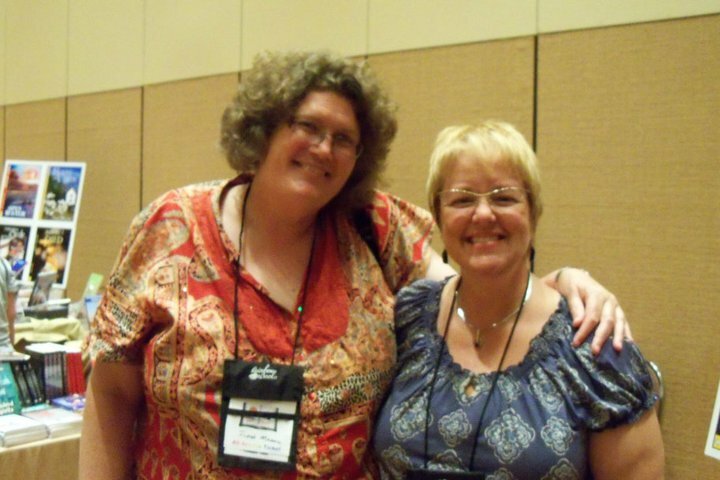 I met Janet Mason at a GCLS conference in Orlando. My mother attended with me. On the first day, we met Janet. I very clearly remember how wide-eyed she was – just taking everything in! The biggest standout memory for me, however, was when Janet met Karin Kallmaker. What a great meeting of two talented women. We all had to pause so I could take a picture of them together. I remember seeing copies of Sinister Wisdom’s When? and Now! issue (number #81 –Fall 2010) with its purple cover) on a table, which leads me to what I remember most vividly. I have a poem in there from my “a woman alone” series which is matched with a poem from my late friend Toni P. Brown from her “the Clementine Poems.” The work is visually similar — short, succinct poems of similar line length. Toni and I were also very similar. We were both tall, with easy laughter. Except for the fact that Toni was African American and that I am Caucasian, we could have been mistaken for sisters. Julie Enszer and Merry Gangemi were editors of that Sinister Wisdom issue. I had corresponded with Fran Day on a previous issue of Sinister Wisdom (76: the Open Issue — Summer 09) which included an essay about my friendship with Toni who died at the age of 55. Fran Day had passed away after that but I didn’t know that until I attended he Goldie Awards ceremony. I had come to the conference alone and even though I met many women there (including Carleen and her mother), I was feeling my aloneness acutely. But as I sat at the Goldie Awards ceremony in the dark, listening to the words of the presenters and award winners, I remember have the strong feeling that we are all connected. Our lesbian words — that were never meant to be spoken (nonetheless written) — are the coarse strands of silk that connect us. It takes courage to put our lives on paper and finding that courage makes us all winners. Janet Mason is an award-winning writer of fiction, creative nonfiction, and poetry. Her commentary is regularly featured on This Way Out, an international radio syndicate based in Los Angeles and aired on more than 400 radio stations in the U.S. and abroad. She is the author of three chapbooks of poetry, including When I Was Straight. Her work has appeared in The Advocate, American Writing and Chiron Review. She teaches creative writing at Temple University Center City in Philadelphia.